Facebook Inc. (FB) continues to be plagued by a slew of issues ranging from international regulatory scrutiny, user privacy issues, high-level employee mass exodus, and questionably toxic company culture. As a result of these overarching issues weighing on the company, the stock has become volatile with dramatic moves in both directions. The stock has traded over a $95 per share range during the past 52 weeks, logging a high of $218 and a low of $123. The magnitude of this move has been frustrating as one issue after another seems to impact the stock despite record revenue and EPS negatively. Pundits argue that the negative confluence of the issues above will drive up costs, narrow revenue streams and weaken the user base. The privacy scandal has already resulted in increased costs surrounding compliance, monitoring, censorship and scrubbing the platform from deceptive marketing. Is Facebook Finally A Buy After The Tech Rout? 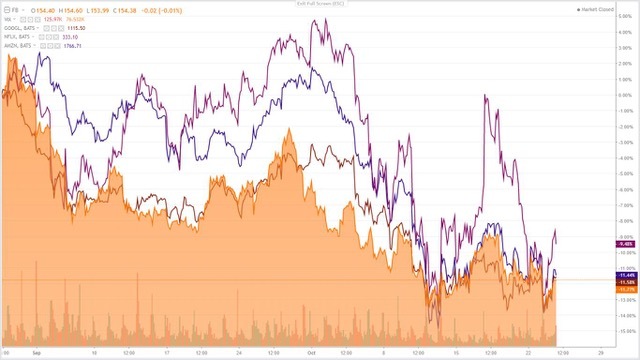 Is Facebook (FB) finally de-risked after its self-inflicted data misuse privacy scandal and the rout in the technology sector? Facebook has been mired in privacy scandals, public relations mismanagement and a very public exodus of many high-level departures across the company. If this wasn’t bad enough, Facebook totally dropped the ball on its second quarter conference call, wiping out $119 billion in market capitalization in a single session marking the worst one day drop for any large-cap company in history. This negative backdrop was met with a technology sell-off in the fourth quarter of 2018 culminating into the perfect set-up to knock the stock into bear market territory. Facebook sold-off during these two waves from $218 in July to a low of $123 in December of 2018, logging a 43% decline over this five-month period. Despite the aforementioned stock implosion, Facebook remains one of the most compelling large-cap growth companies posting double-digit growth with P/E and PEG ratios well below its peers. Recently, JPMorgan reiterated Facebook as a “best idea” and expects the stock reach $195 and “climb the wall of worry.” Baird also came out with an outperform rating basing its target of $195 on stabilizing engagement on its Facebook platform and growth in its Instagram property. Facebook has grown its revenues by over 30% for 20 consecutive quarters with its latest quarter coming in at 33% revenue growth. As this revenue streak continues coupled with the dramatic decline in its stock and cheap valuation, I think Facebook is de-risked. The technology cohort has started to show signs of resurgence with Facebook and Netflix (NFLX) leading the pack with plenty of upside for the former. Facebook’s (FB) disastrous second quarter conference call erased $119 billion in market capitalization in a single session marking the worst one day drop for any large-cap company in history while the stock shed a fifth of its value. Since then, ancillary fallout emanating from its core data misuse scandal involving Cambridge Analytica continue to surface. Security issues affecting 50 million accounts, a lawsuit alleging concealing video ad measurements and increasing EU scrutiny have continued to plague the stock since its second-quarter implosion. The original mishandling user data resulted in the stock tumbling from $195 to $152 or 22% at the time. Facebook appreciated off those data misuse lows and broke out to $220, however, this scenario ended abruptly on the heels of its Q2 earnings. Facebook issued a major guide down in growth for the next few quarters tampering growth expectations in the near term. Facebook is facing a challenging confluence of slowing revenue growth, margin compression and stagnant daily active users in the near to intermediate term. There’s been a recent initiative that has the backing of four large institutional investors to remove Mark Zuckerberg as Facebook’s chairman in the wake of all of these security issues. Despite these headwinds, Facebook is still posting accelerating revenue growth across all geographies, expanding market penetration with Instagram’s IGTV, Facebook’s Stories and monetization efforts in Messenger and WhatsApp. Facebook is still poised to grow at a double-digit clip with the most recent growth rate coming in at 42% in Q2. The long-term picture looks bright for Facebook, and the recent sell-off in the stock and tech cohort is a good opportunity to initiate a long position as the company contends with and addresses all the issues across its platforms (Figure 1). Facebook remains a premier large-cap growth stock and inexpensive relative to other large-cap growth stocks in its cohort heading into Q3 earnings. Facebook’s (FB) fundamentals were shining bright and outweighed its data misuse scandal from months’ prior leading into its Q2 earnings. In the wake of mishandling user data, Facebook’s stock tumbled from $195 to $152 or 22%. Facebook was well off those data misuse induced sell-off lows and marched right through its previous 52-week high and broke out to $219 for a nice ~44% rebound. This scenario ended abruptly on the heels of its Q2 earnings which came in shy of analysts’ expectations on the revenue front. Facebook also issued a major guide down in growth for the next few quarters tampering growth expectations in the near term. Facebook is facing a challenging confluence of slowing revenue growth, margin compression and stagnant daily active users in the near to intermediate term. Facebook’s CFO stated that investors could expect "revenue growth rates to decline by high single-digit percentages from prior quarters." Despite these headwinds, Facebook is still posting accelerating revenue growth across all geographies, expanding market penetration with Instagram’s IGTV, Facebook’s Stories and monetization efforts in Messenger and WhatsApp. Factoring in this high single digit decrease in revenue, Facebook is still poised to grow at a double-digit clip with the most recent growth rate coming in at 42% in Q2. The long-term picture looks bright for Facebook, and the recent sell-off is a good opportunity to initiate a long position as the company contends with and addresses all the issues across its platforms. Facebook remains a premier large-cap growth stock and inexpensive relative to other large-cap growth stocks in its cohort.